For sparkling windows inside and out choose Zack’s Glass Cleaning. Tired of squinting through your dirty windows to see your backyard? What about those hard water stains on your windows you can’t seem to clean? Sometimes thorough cleaning needs to be completed by professionals. Fill out the form below to receive an instant residential window cleaning quote online, 24 hours a day! So stop dreading your dirty windows and choose Zack’s Glass Cleaning! We are a professional and efficient full window cleaning service in Utah. Zack’s Glass Cleaning will leave your windows looking brand new inside and out! You will finally be able to look through your window and see beyond the inside of your home. There are many different components to making any residential property look new. Depending on the house, your roof, front yard, garden, and many other features can give off the appearance of a brand new space. One of the most important aspects is the look and cleanliness of your windows. Depending on the setup of your home, there are times when certain windows of your house are difficult to clean but also centrally located for the world to see. It can be a challenge without proper equipment to adequately clean the exterior windows of your home. 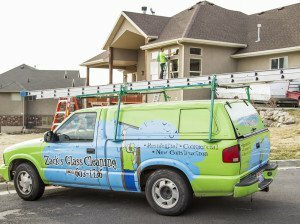 Zack’s Glass Cleaning has been in business for years helping residential customers in Ogden and the surrounding areas make their windows shine the way they did when they were first installed. Weather, animals, dirt, and other debris can leave your windows looking dirty and shabby. Let the professional window cleaning experts at Zack’s clean your windows today. We guarantee your satisfaction with fresh and sparkling windows. So stop looking through dirty windows and call Zack’s Glass Cleaning today! As a small business, Zack’s Glass Cleaning knows the importance of hiring the right team to ensure that all of our window cleaning maintenance services is always done right. We take pride in employing technicians who understand how to do their job at a high level because when we operate at a high level, our customers are satisfied. If you have any questions or concerns during or after one of our cleanings, do not hesitate to call us for more information. Our goal every time is that window cleaning services should be top level, professional, efficient, and competitively priced. Our quality control is always at top level and if you feel your window cleaning isn’t the best it can be, we want to know! Zack’s Glass Cleaning has been a successful small business in the Ogden area for over ten years because we believe that top level customer service and attention to every detail goes a long way with retaining our loyal customers. We know that a happy customer is a repeat customer and we are committed to ensuring that your windows are sparkling after every cleaning. We know that housework and cleaning services of any kind can be a hassle and expensive. At Zack’s, we pride ourselves on top shelf work at competitive rates. To find out more about our residential window cleaning services and maintenance packages, contact us today. A member of our team will be more than happy to assist you in telling you more about our company and the window cleaning services we provide. For top level residential window cleaning services in Ogden, contact Zack’s Glass Cleaning today at (801) 603-1736.